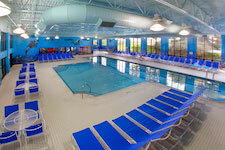 The following Lancaster County hotels and motels offer either indoor pools, outdoor pools, or both for their guests. Some of these have indoor water park types of features, while others may have hot tubs to relax in. If it’s hot or cold outside, there’s always somewhere in Lancaster County with a pool where you can enjoy swimming or just relaxing. Adjacent to Adamstown antiques and turnpike exit. Check rates. Award winning full service hotel. Full breakfast buffet, indoor pool. Visit website. Quiet, country location, yet close to attractions, restaurants, shopping. Learn more.